Inktober - Clyde's Great Pumpkin! I had a blast drawing this one--I wanted to draw a big cute piece to get into the spirit of October and Halloween and was struck with the idea for this one and it gripped me tight! 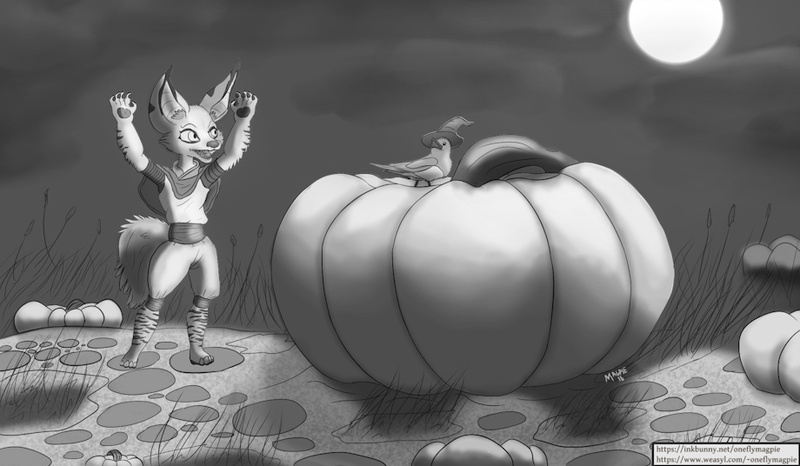 It's Clyde, prayke's adorable little adventurer, having discovered the perfect celebratory gourd for the season with his little witch friend! This was a bit of an adventure in and of itself to draw and keeping in the theme of trying to keep pushing at exploring new territories, I thought it would be fun to push for more of a full scene, with nighttime lighting and trying to make the fore characters and scenery really -pop-. I'm pretty happy with the results overall, and hope you all enjoy this piece too!